Last Spring, Mr. Maui Stamper and I were in Phoenix and took the opportunity to spend a few days in the Grand Canyon. WHOA. It is grand! But this isn’t about the Grand Canyon, it’s about something I saw there. I saw a Chicken made by Edith John. Edith is a Navajo from a family of Navajo crafters. II saw her work at the Heard Museum in Phoenix too. (It’s a FABULOUS museum – but this post is not about the Heard.) 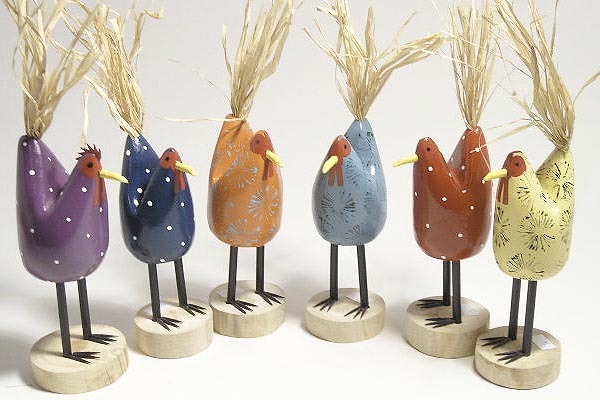 I have a soft spot in my heart for chickens, at least hand-crafted chickens. The real thing…well, I like them in principle, but I’m not much of a Green Acres kind of girl and I don’t see myself putting a chicken coop in the back yard. ANYWAY…I had spent some time looking at Edith’s chickens while I was at the Heard, and I saw them again in various gift shops throughout Grand Canyon National park. I couldn’t make up my mind. I didn’t see one I really loved above all the rest, and to tell the truth, I’d already spent enough money for one trip. Edith’s chickens are well priced for hand-crafted art, but they are not inexpensive. I came home without one. Oh.My.Goodness. If ever a chicken was meant to live in my home, this was the one. Not to mention that the price in my local thrift shop was many times less than the price at the Heard or at the Grand Canyon. SUCH a handsome bird!!! He was a tad dusty and clearly needed rescuing from the thrift shop. There’s a little ding or two in his paint job, but that just endears him to me all the more. Clearly this chicken was the one I was meant to have. He has a permanent home on my kitchen counter. I would love to say that I was listening to that small, quiet voice inside when I was shopping at the Grand Canyon, but if I’m honest, I have to acknowledge that I was listening to the nagging voice that pays the bills. Either way, this was a truly serendipitous find. He is! He tells me that YOU should have real chickens out there in Green Acres! I agree! He is VERY happy in my kitchen. Thanks for your comment.